"What a creative way to say I love you.....but we all stink sometimes. It is more of a US gift....but he just loved it!!" 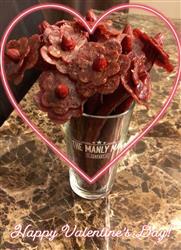 "My husband loved his jerky bouquet. He said the jerky was really good." "My grandson,Wyatt loved the jerky!!!" "Ordered for my BF for Valentine’s Day. The presentation was great and the flowers were really tasty! Plus, he got a cool beer glass as a keepsake. He loved it all!" "Experience was great. I ordered this in original for my boyfriend as a random thank you for being you gift. He LOVED it. Was super surprised and was blown away by how cool they were! Almost felt bad eating them. Delivery was also super quick. I highly recommend this product!! The original are FANTASTIC, but can't speak to the other flavors. Next time I'm ordering the teriyaki =D "
"My recipient very much enjoyed the bouquet I got him !! However I had ordered a discreet box thinking he would not know where this came from seeing how I wanted it to be a surprise and he would be home when it arrived it did not come in a discreet box but overall I will order again just was disappointed!!" "This was the second bouquet I purchased, and this one was to honor a friend's retirement from the police force. Your company worked with me on the shipping date so it would arrive as close as possible to his retirement date. He received it yesterday, and the official day is tomorrow...so I would say that was great timing! I appreciate the personal communications from your company and thank you for working with me. He thought it was a great idea to send something like that, and he and his family are enjoying the treat! " "Overall experience was prime! Recipient was really moooooved by it. Ok, I’m done. Plan on ordering more for my other friends whose bdays are later this year." "Very good, yes he was very surprised!" "I sent a half dozen arrangement to my son to help him get through his finals for second trimester. He really enjoyed the concept and thought it was great! He loves jerky and said it was delicious. " 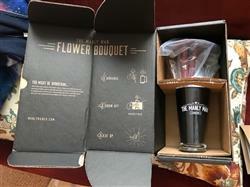 "My boyfriend loved the bouquet and beer mug. My daughter liked it and mentioned how she would like one! The jerky was fresh and very tasty. Thank you for a great product!!!!" "Experience quick and friendly Recipient loved the flowers and the jerkey"
"Experience was great! One flavor in the mix I wanted wasn't going to be in stock for a couple days. Their customer service team reached out and was more than helpful AND sent an extra little something just to make up for it! I actually sent this to a friend who's dad had passed. So many people send flowers to the visitation. I wanted him to have a little something different and just for him!" "A unique gift for a real manly man! The man I sent it to really enjoyed it." "Packaged very well, great product. " "My boyfriend and his friends absolutely loved them, he didnt know what to say when I brought them out, but when he bit into them, that's when all the words came out, he said that where ever i got them they were the best jerky that he has tasted and that he loved them. Thank you so very much." "My boyfriend enjoyed it even though I messed up the addresses. We definitely had a good laugh but he was super surprised when he saw it!" "Terrific gift that really made my husband smile. " 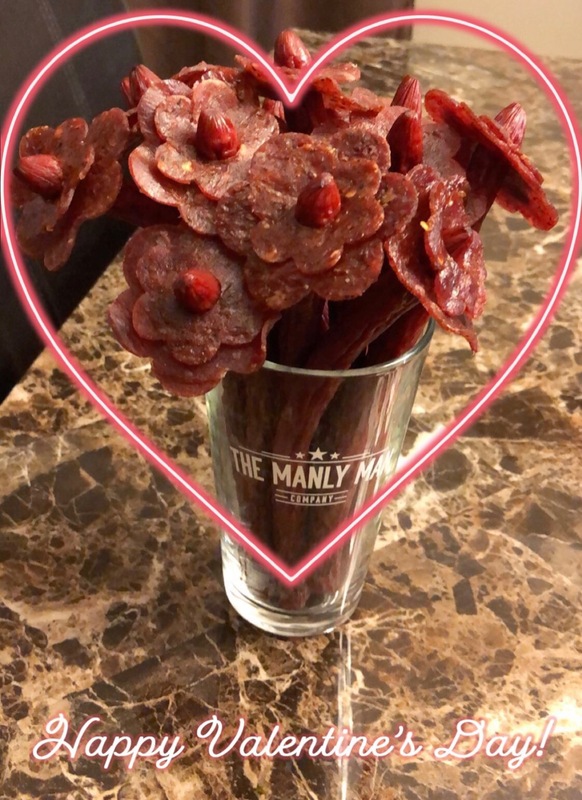 "Yes he enjoyed it, it was nice to get something other than flowers "
"I ordered my husband the jerky flowers for Valentine’s Day and he loved them. I thought I had made a mistake and ordered the pint glass when I meant to order the beer mug, but it turns out I was sent the wrong item. I sent an email about my disappointment. They immediately apologized and fixed the issue by sending me the mug I initially ordered. Great products, fast shipping, and AMAZING customer service. Thank you!" "This is an amazing gift idea for any man! They don’t like to receive real roses because it’s to girly but love jerkies. So what better way to combine the two together. My husband loved them and enjoyed them. I also had some myself and loved that the jerkies were so good and fresh. Thank you much for the amazing idea! I love unique and creative gifts like this." "Beef Jerky taste great. The only disappointment was that I went to purchase on Feb 1st for valentines and everything was either sold out or on backorder. I didn't get my order until the end of the month. " "It was great. Both me and wife were "men" though 10 min. later our dog ate the whole thing." "Buddy loved it. Recommend for anyone." Flowers die and get thrown out. Not these manly flowers. "What a great treat! 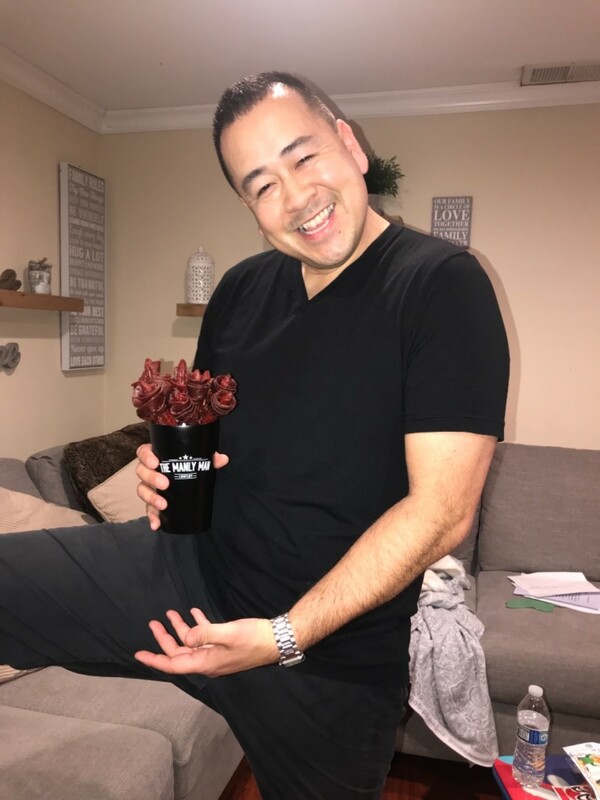 My wife and I saw the product watching one of the cable news channels, and instantly purchased a bouquet for Valentines Day (for me). Love the jerky, it was the variety version, and all of the different flavors (especially the hot) of jerky were delicious. 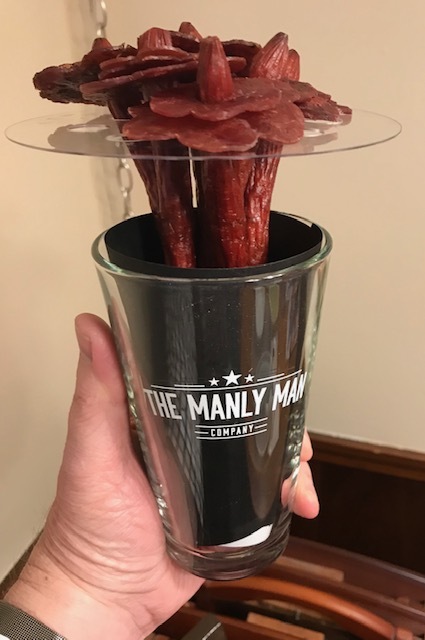 The vase, (aka: pint glass) is solid and it a great leftover once the jerky is gone. - Product is great, customer service is great. Why are you still reading this and not ordering one for you or a friend? " "I received this Man Card as a courtesy. There was a question about my order of the Jerky Bouquet, and the company was gracious enough to sent this along. The opener fits perfect in my wallet, and it works great to open bottles. Great company, products, and customer service. " "Very much so. He was really pleased and we will buy from you again. Although, your spicy is very, very spicy. 😁"
"This company us very responsive and accommodating. I asked if they could not have "manly man" written all over it because this gift was not for a man, and they had options to do so. They were very quick to work with me and Jackie was great! Loved the bouquet once it arrived!" "I was looking forward to the mix including hot BUT the customer service and options to make things right and still get it delivered in my opinion speaks highly of The Manly Man Customer Service Specialist. The little bag of the hot nibbles left my men in my life eager for more. So this will definitely be another purchase!" "My husband loved it! Great manly gift for Valentine’s Day! BTW the jerky was delicious. Definitely would order it again."